In the almost nine years of writing on this blog and not a few write-ups about music, I can't recall doing any review of an original orchestral composition. Mostly it has been soundtracks and albums by "Weird Al" Yankovic. And now, after listening to A Warrior's Odyssey a bunch of times... I can't honestly claim that I have skill enough to write about how magnificent an album this is! Kouneva is no stranger to dramatic composition. She has previously collaborated with other artists, including Steve Jablonsky on the soundtracks for Transformers: Revenge of the Fallen and Gears of War 3, as well as contributing to The Matrix Revolutions and Pirates of the Caribbean: At World's End. With A Warrior's Odyssey however, Kouneva is relying on the music itself to convey a sense of experience of - and very personal evolution ensuing from - the brutal realm of modern battle. There are no visuals playing on the screen or in your head to juxtapose this album with. And it doesn't need them, either. A Warrior's Odyssey is a flowing work of eighteen tracks making up a triptych of movements. They beautifully convey drama in all its buildup and resolution, without a typically requisite plot to steer it with. But Kouneva arouses emotion with such skill and thoughtfulness with A Warrior's Odyssey that it stands beautifully as a work unto itself, without needing a commercial story behind it. And really, music like this can evoke thoughts and images better than any soundtrack could. "Waiting for Dawn to Break" brings to mind the fleeting night and anticipation of the combat to come. The next several tracks take us quickly into the fray of battle, interspersed with moments of personal conflict, with Track 4 - also titled "A Warrior's Odyssey" - the masterpiece of the tapestry's first part. It's onward from "Forgotten Steeples", the eighth track, that A Warrior's Odyssey really takes off from a glorious opening round. These are the moments of introspection: all-too-brief and desperately grasped moments of reflection, doubt, wonder. The individual focus is washed away again in the deluge of war with the album's third section. And here is where Kouneva flexes all her considerable talent, masterfully interweaving the album's previous forays into both personal emotion and the brutality of battle. I found my three favorite tracks from this part to be "Fading Fortitude/The Battle Must Go On" and "Pilot Bombardier and Dogfights" (each of which has been nominated for industry awards) and "Airplane Bound for the Skies": the album's grand finale. 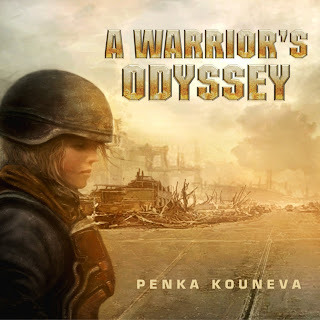 Penka Kouneva has enjoyed an already stellar career in Hollywood, but I have a strong feeling that A Warrior's Odyssey will prove to be her real breakout album. One that will put her in high demand as both a commercial composer and originator of the highest caliber of classical style. So it is that A Warrior's Odyssey gets this blogger's highest recommendation for your music library! Click here to find it at Amazon.com. Or head on over to iTunes and purchase it there if you can't wait for a nice shiny disc. However it is that you buy it, you won't regret that you did!